An expanded version of the Fuzz Elements Earth with a parametric EQ section. The sounds of Fuzz have left an indelible mark on the history of rock guitar. Yet despite its undeniable influence, the definition of what constitutes a "great" Fuzz tone has remained strongly subjective and almost eternally elusive - Until now. Introducing the Maxon Fuzz Elements - seven models designed to reproduce the classic and unique sounds of the World's most desirable vintage Fuzz pedals. Using modern software technology, Maxon has modeled and mapped the complex elements that make up the core sounds of these legendary pedals, reproducing them using advanced analog circuitry that is as accurate as it is stable. 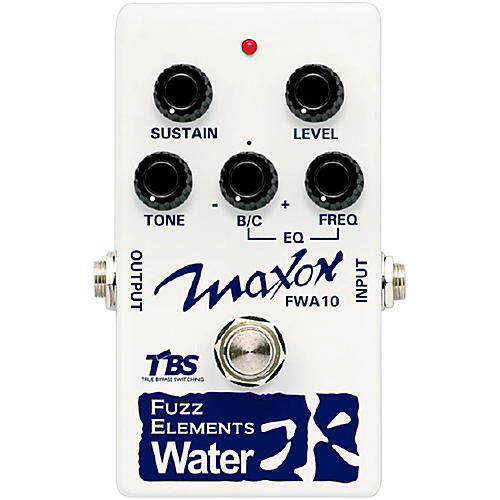 The Maxon Fuzz Elements Water expands on the classic fuzz/distortion sounds of the FEA10 by adding a parametric tone section to the circuit. Select a frequency and then cut or boost to create a variety of new fuzz/distortion tones. True Bypass Switching.